^ 1.0 1.1 1.2 Govorov L.A.. [2013-08-03]. ^ 2.0 2.1 2.2 2.3 David Glantz & Jonathan House. When Titans Clashed: How the Red Army Stopped Hitler. Kansas University Press. 1995. ISBN 0-7006-0899-0. ^ 3.0 3.1 3.2 3.3 3.4 亚·米·华西列夫斯基. 毕生的事业. 三联书店. 1977年7月. ^ John Erickson. The Road to Stalingrad: Stalin`s War with Germany. Yale University Press. 1999: 6. ISBN 0-300-07812-9. ^ Киселев, А. Н. Полководцы и военачальники Великой Отечественной. Молодая гвардия. 1971: 115. ^ 格奥尔基·朱可夫. 回忆与思考. 中国人民解放军军事科学院外国军事研究部译. 北京: 中国对外翻译出版公司. 1984年. ^ Glantz, David M. The Battle for Leningrad 1941–1944. Kansas University Press. 2002: 182–189. ISBN 0-7006-1208-4. ^ 弗里茨·曼施坦因. 失去的胜利. 战士出版社. 1980年12月: 250. ^ Toomas Hiio. Combat in Estonia in 1944. 2006: 1035–1094. ^ 10.0 10.1 什捷缅科. 战争年代的总参谋部-第一部. 中国解放军军事科学研究院外国军事研究部译. 军事科学出版社. 1984年7月. 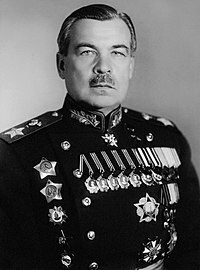 ^ Today the funeral of General Vladimir Govorov. [2013-08-03].